This item is currently on backorder. Orders containing this item will ship as soon as we have the 24 oz 3D Express Wax in stock. Estimated ship date: 4/26/19. Saves valuable time and protects for weeks! The 3D Express Wax quickly adds a deep gloss and layer of protection to your paint. Spray it directly on your paint or on an applicator pad and wipe it on the desired areas, then buff off the excess residue. You will be quickly impressed with the depth and gloss of this wax and wowed with how easy it applies and removes. This spray-on application saves a great deal of time and you can protect all of your painted areas in around 10 - 15 minutes! Upon completion the paint will look amazing and easily repel moisture and environmental contaminants. 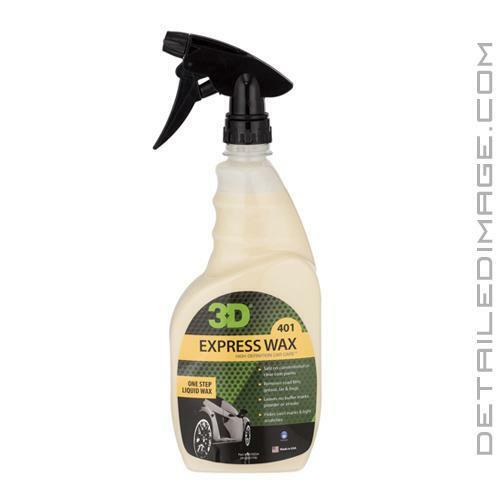 Express Wax can even be used on semi-wet cars and even in direct sun so the application could not be easier. A little bit of this wax easily covers a panel so you are also getting an awesome value! Protect your paint from harmful UV rays, fallout, road grime, etc. with the 3D Express Wax! DIRECTIONS: SHAKE WELL BEFORE EVERY USE. Apply evenly, spreading a thin amount onto the surface using a wax applicator and let it haze. Buff off with a clean, soft cloth or microfiber towel until desired shine is achieved.